Cable dipped to session low at 1.3206, trimming some gains, as traders booked profits after three-day rally. Also, comments from PM May about customs union which is a big issue in divorce talks, weighed, as pound last sharp fall on 21 Sep was triggered when May talked about Brexit. 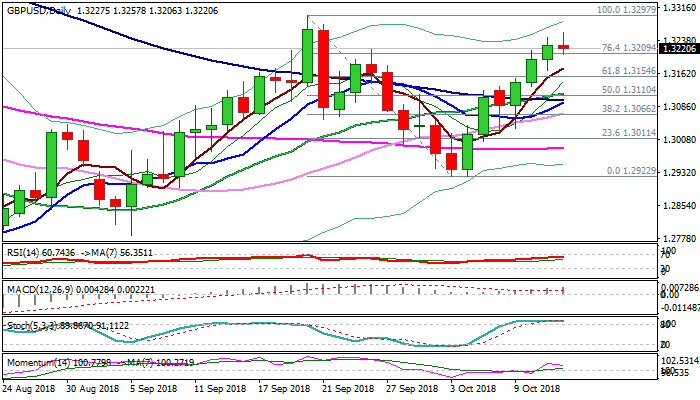 As mentioned in the previous report, 1.32 zone marks solid support and so far contained dip which is seen as consolidation ahead of final push higher, as overall sentiment is positive on strong hopes on signals that Brexit deal could be reached on EU summit next week. Dip-buying remains favored, although stronger dips on week-end profit-taking, cannot be ruled out.